On Friday, Army Spc. 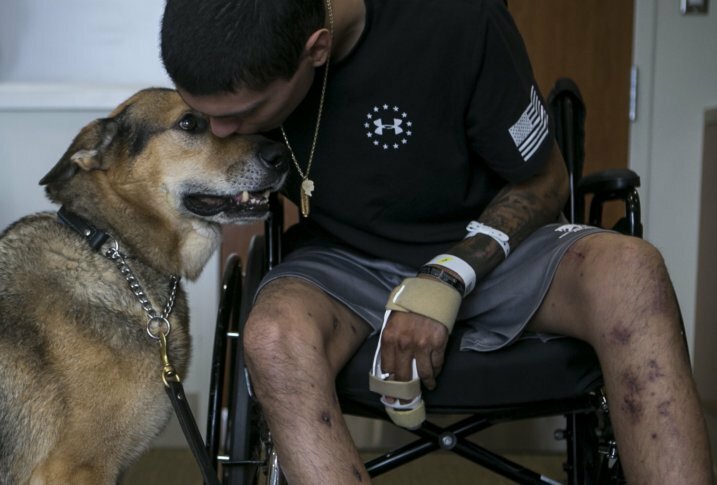 Alec Alcoser and his working dog, Alex, were together once more, this time at the South Texas Veterans Health Care System's Polytrauma Rehabilitation Center. It was an emotional reunion, with the Harlandale High School graduate wiping tears from his eyes at one point and Alex licking his face. SAN ANTONIO (AP) — Six weeks ago, Army Spc. Alec Alcoser and his working dog, Alex, turned the corner of a narrow street outside Bagram Airfield just after dawn and saw a young Afghan coming toward them. The San Antonio Express-News reports two Afghan and three Czech soldiers moved between Alcoser and the civilian to conduct a search while he called the dog back and bent down to get a cigarette. Suddenly, they were enveloped by a bright flash. Alex yelped. Alcoser went down. The dusty, smoky air turned yellow and orange and a firefight broke out. The dog stayed at his side. On Friday, they were together once more, this time at the South Texas Veterans Health Care System’s Polytrauma Rehabilitation Center. It was an emotional reunion, with the Harlandale High School graduate wiping tears from his eyes at one point and Alex licking his face. It was the first time they had seen each other since both were in Washington, D.C., where each received the Purple Heart. And if all goes well in rehab over the next few months, they’ll be together for good, buddies until the end. They were close in Afghanistan, where Alcoser was 6½ months into a nine-month deployment when they got hurt. They were together pretty much everywhere Alcoser went, except the dining hall. On his days off, they slept in the same bed together, rising late and enjoying the leisure time. On duty days, they had rituals. “On a day with a mission, we’d wake up, I would give him a doggie treat and I would have some ice cream before we went out, and when we got back, we usually slept,” Alcoser recalled. The Aug. 5 suicide bomber’s blast left Alcoser with shrapnel wounds and broken bones. He also had a mild traumatic brain injury, but his physical medicine and rehabilitation specialist, Dr. Blessen Eapen, said Alcoser escaped the explosion without any loss in cognitive ability. Alex lost his left rear leg near his hip. Both are learning to get around again. Snapshots show Alex reluctantly settling in an underwater treadmill at Joint Base San Antonio-Lackland. Alcoser took shrapnel in about 30 percent of his body — most of it in his lower extremities. Some of it continues to come out, slowly, in an often painful process. The list of broken bones is long and includes both arms and legs. He walks with a cane or a walker. Alex sometimes limps around but occasionally moves as quickly as a dog with all four legs. “When we say ‘polytrauma,’ he’s got multiple injuries, multiple fractures. . He’s pretty hurt,” Eapen said. There are goals to reduce Alcoser’s dependence on opioids and in time get him well enough to start work at the Center for the Intrepid at JBSA-Fort Sam Houston. They’re estimating about four to six months, and so I’m already a month and almost half in, and I’m already walking, so I think I’m going to beat that time,” he said. There have been too many surgeries to remember, but they’re over for Alcoser. A good deal of rehab lies ahead for both him and Alex, but an interesting thing happened Friday afternoon to the 8½-year-old German shepherd, who is headed to a medical retirement from the Army. It seems he’s trying to get back on the job. Trained to detect explosives and corner suspects who try to run and hide, Alex tried to search a car after arriving at Audie Murphy VA Hospital. “When they’re old and retired, they still don’t know they’re not supposed to work,” said Regina Johnson, a retired Army dog handler who works in the Defense Department’s DoD Military Working Dog Breeding Program at Lackland. Ask Alcoser if he finds the process of learning to walk again frustrating, and he’ll wave off the notion. He has a wife, Misty, and a 6-month-old son to look after, and then there is his mom. Ann Marie McGrew lives in Houston and drives to see him at the hospital every weekend. Alcoser hopes to return to work as a soldier, in time returning to his post, Fort Drum, New York, and eventually get promoted to sergeant. Give him the chance, and he’d go back to the war zone. Alcoser has fallen brothers to honor. Those Afghan and Czech soldiers standing between him and the man with the suicide vest absorbed the worst of the blast. The Afghans survived. The Czechs were killed instantly. “I don’t have any frustrations, I just take it day by day, that’s all I can do. There’s no point in being mad or sad or anything like that. I’ve got to live through the people who died for me, so they give me a lot of strength,” he said.